Pyrocontrole proposes a choice of suitable temperature sensors equipped with specific protection to match your application. Metallic, ceramic or composite protection makes the temperature assemblies more resistant and extends the life spans of the sensors. Temperature measurement in melting baths and holding baths. Measurement or monitoring with a measurement assembly equipped with a handle. Bath control measurement with an elbowed fixed and/or removable temperature assembly, in order to avoid breaking the protector when the furnace is loaded with aluminium-alloy ingots. Bath control measurement with straight temperature assembly fixed in the refractory, with a known thermal gradient. Qualified to withstand high temperatures, our offering of temperature assemblies can be used to measure temperatures very accurately, thus improving the quality of your products and the safety of your processes. In severe environments, these assemblies can be used to check the dome temperature and optimize management of the energy used. They have a particularly long life span because their protection makes them particularly rugged. Accurate and resistant, these assemblies are inserted in the refractory with or without protrusion, these assemblies monitor the temperature and ensure that the process remains safe. Subject to temperature constraints, the sensitive element in these sensors is protected by a sheath made of a material suitable for the expected environment. Qualified to withstand high temperatures, our offering of temperature assemblies can be used to measure temperatures particularly accurately, thus improving the quality of your products and the safety of your processes. 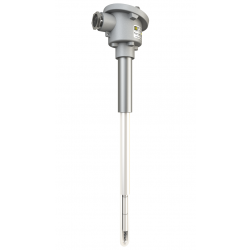 Installed in the refractory of the furnace shaft, this temperature assembly monitors the temperature of the installation and helps to guarantee that the process remains safe. Positioned on the hot blast outputs, this measures the temperature of the fumes. When osition in immersion, this temperature assebly can be used to measure the hot blast temperature on the output of a Cowper stove. This is essential to ensure satisfactory furnace efficiency. This assembly benefits from a high temperature withstand and is equipped with a specific connecting head which can withstand mechanical stresses and shocks. Depending on where it is mounted, this can be used to monitor the temperature of cooling oil or cooling water. Control systems are essential to optimize the temperature. Equipped with cutting-edge technology, the Thyritop 40 and Thyritop 30 power controllers are ideal for professionals' needs. These communicating power controllers control all the resistive and inductive loads for electrical heating. Available in 3 versions, from 37 A to 2,900 A, it offers accuracy, flexiliby and a rugged design to control your heating elements. The Thyritop 30 power controllers are ideal for the most frequent electrical power control requirements . Simple to use and particularly rugged, they offer a low-cost power control solution. The precision and homogeneity of the furnace holding temperature are two crucial features for the quality and cost of the heat treatment obtained. To check a furnace's temperature homogenity, the PYROTRACER digital recorder is the ideal tool. Specifically designed for quick, simple configuration and implementation, this “plug & play“ paperless recorder can be used to check the temperature in real time and record up to 18 measurement channels. Security of this “QUALITY” recording is ensured by means of encrypted, unfalsifiable files. These data recorders with touch screens are ideal solutions for data acquisition and analysis of processes in all industries. Specially designed for easier use, this new generation of C.A 6500 graphical recorders helps to make your work significantly simpler and, above all, more effective! Major advantages for optimum results in the field! New generation adapted to meet the industrial process supervision requirements in metallurgy, foundrywork and the iron and steel sector. From recording of the data to control of the machines, the new CPS Touch® range of touch human-machine interfaces offers multiple advantages. Comprising 5 models, from the simplest to the most sophisticated, the CPS Touch® range is suitable for any supervision requirement.